Christian McGhee was selected as a recipient of the President’s Prize to help support incarcerated youth through the organization Getting Ready for Opportunity and Work. It’s hard enough taking an exam at 8 a.m. but it’s even harder when President Michael Drake interrupts it, announcing you will receive the highest recognition given to a student by the university. That’s precisely what happened to Christian McGhee, a fourth-year in marketing. McGhee was a few minutes into a marketing research exam when Drake came into the classroom and began explaining the President’s Prize to the entire class. McGhee was chosen as one of two recipients of the President’s Prize. According to the award’s website, the prize will provide him with a $50,000 living stipend and up to $50,000 in funding for his project Getting Ready for Opportunities and Work, which aims to support incarcerated youths. GROW has already provided support to this population through donation drives for Star House — a local homeless youth shelter — as well as visits and providing curriculum for professional development to the Circleville correctional facility. But McGhee said the goal is to have a transition house that enables incarcerated youth to become “thriving” members of society upon their release. McGhee said this project originally started as an honors cohort Impact Challenge. 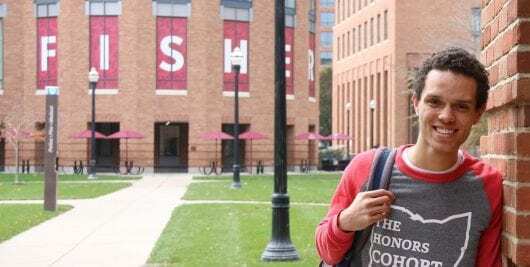 He had prior experience with mentoring middle school students, but had not considered working with incarcerated youth until Susan Colbert at Ohio State Extension — an office at the university that works to connect students with Ohioans — suggested the idea to his cohort group. Colbert connected the group with Franklin County Court of Common Pleas Judge Terri Jamison, who sat them down in her chambers and explained the struggles these youth face and the help they need. “It was hard for us to not do anything about it after that,” McGhee said, adding that the group was “compelled to really start making a difference in these kids’ lives. The group is working to establish a nonprofit organization and gain 501(c)(3) status, which will allow them to get tax deductions from charitable donations and have a house donated. “For us to have a house, we really needed the financial backing, the support of the greater university so we knew from the beginning that we were going to be applying [for the President’s Prize],” McGhee said. Although GROW is a team of individuals, Shepfer said that McGhee applied for the prize as an individual because of his leadership role in the organization. McGhee’s hope for GROW is that it will be able to be replicated and have multiple homes available to a variety of populations that need more support. As for personal goals, McGhee said that this experience will help him as he pursues ministry. Shepfer said through GROW, McGhee has found a voice and become more culturally aware and sensitive to issues happening in the community. And if you’re wondering how McGhee did on his exam, no need to worry.